Céleste is a representative of the 46th generation of a women lineage whose name cannot be written nor said. Initiated and taught by her maternal grandmother, she is the beholder of the wisdom of her ancestors. 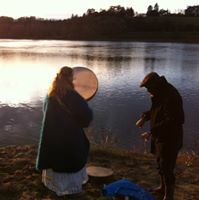 Since birth she is Music Passer, talks and dances with Water. She is holder of the Sacred Fire. She passes on women ancestral practices needed for well living together and joy in the family. She received the ki-Muntu sacred choreographics and teaches them with Célestin Mukanda.